Your nose is running, you can’t stop coughing, your eyes are itchy, and you feel terrible. 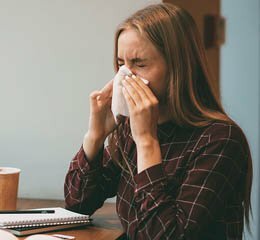 It’s fall, which means allergies and the common cold are both potential causes of your symptoms. How can you interpret your symptoms to determine the real cause of your misery? Use this guide to help! 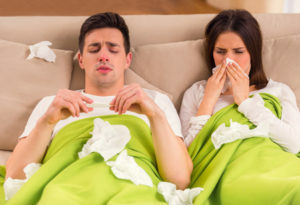 Though the symptoms of allergies and the common cold are similar – runny nose, sneezing, red eyes, lethargy – the triggers of the symptoms will be different. If your symptoms continue throughout the day and become even worse before bed, it might be a cold. A medication like Dayquil might be able to bring you relief. You’re not the only one suffering from allergies this fall! 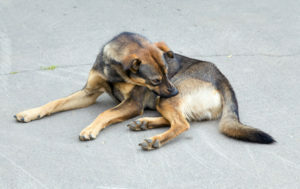 It’s possible that your pet is experiencing uncomfortable seasonal allergy symptoms as well. Allergens saturate the air this time of year, especially in Florida where the temperatures don’t cool down quickly. Just like you rely on a daily antihistamine to survive your worst allergy symptoms, your pet needs appropriate medical care to avoid and prevent the discomfort that develops as a result of seasonal allergies. Here’s what you should know to keep your furry friend comfortable during allergy season and beyond. Now that the harsh Florida summer is subsiding, fall allergies are arriving to make you equally as miserable. 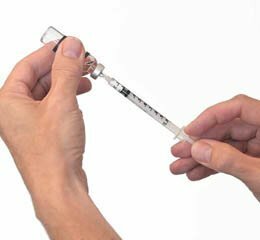 If you’re tired of spending every autumn behind a box of tissues, allergy shots could offer the relief you need. Here’s everything you should know about this treatment option and its potential benefits for your quality of life. Allergies come in many different variations, and your doctor needs to identify your specific allergens before treatment can begin. Allergens are uncovered using a “scratch test.” During a scratch test, your doctor places several small scratches on your arm or upper back. Small amounts of common allergens are placed on the scratched area. 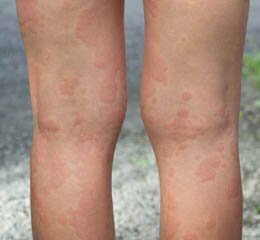 Hives, also known as urticaria, is a condition that triggers itchy patches of skin that turn into swollen red welts. You may only experience this issue once or twice, or it may develop into a chronic condition. Either way, an allergist can help you determine the root cause of your hives and recommend a lasting treatment to preserve your comfort and health. 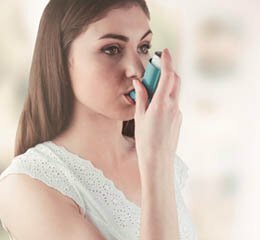 Asthma and allergies aren’t just minor inconveniences; they are serious respiratory conditions that need to be properly treated and prevented. Medications are important, but improving the air quality of your home is also a powerful tool to combat allergies and asthma. The following tips will help you make simple changes to fix or remove triggers and make your home a more welcoming place to breathe. Most students can enjoy school lunches, snacks, and birthday treats without a second thought. 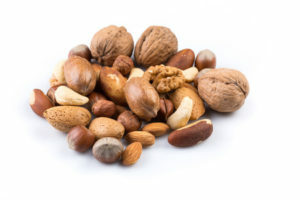 However, as a parent of a child with food allergies, you know how challenging and dangerous it can be to avoid potential food allergy reactions, especially since you can’t be there to double check everything your child eats or touches. The new school year is right around the corner, and you want your child to enter school feeling confidence and joyful, not nervous and fearful. With the right preparation, you can help your child stay safe from food allergies and embrace all that the new school year has to offer. Work with the school to create a comprehensive Food Allergy Management and Prevention Plan. Florida’s summer air doesn’t just become extremely hot; it becomes unhealthy, too. Air quality advisories are often announced on hot and humid days, making you wonder if you should venture from your air conditioned home or just stay inside where it’s safe. It’s important understand why hot summer days cause such poor air quality, and how you can protect yourself from such dangers in the future. Why Are Hot Weather and Poor Air Quality Connected? The dangerous combination of sunlight, high temperatures, and stagnant air combine to produce ozone. High levels of ozone reduce lung function, trigger inflammation of the airways, and irritate your respiratory system. Epinephrine is a life-saving drug that millions of children rely upon, so what happens when the most widely used allergic reaction treatment experiences a shortage? That’s exactly what is happening right now with Mylan’s brand-name EpiPen. The FDA added epinephrine to its drug shortage list in May, leaving parents around the country scrambling to find a way to fill prescriptions for their children before the school year begins. If your child relies on an EpiPen to avoid dangerous allergic reactions, this is information you need to know! An EpiPen is an auto-injector that contains epinephrine, a chemical that narrows blood vessels and opens airways in the lungs. It is a necessity for families with children who suffer from severe food, insect, or drug allergies that can trigger fatal reactions. Having an EpiPen on hand makes it possible to immediately prevent dangerous allergic reactions like wheezing, increased or decreased heart rate, and anaphylactic shock. Nearly 25 million Americans suffer from asthma, a chronic disease that causes the airways to become inflamed and obstruct breathing. Though there is no cure for asthma, proper diagnosis and treatment can help you live a normal, active life with your condition. Get started with the basic information here, then call an allergy specialist to begin your own recovery process. 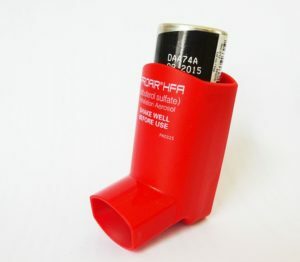 What Is Asthma, and Do You Have It?